Originally, I wasn’t sold on the idea of Sydney as the narrator. I liked her well enough from Rose’s perspective, but she wasn’t a character I loved. I picked up Bloodlines with the thinking, “Well, if Adrian’s in it, it’s worth it.” Given that, Sydney was a nice surprise. Now that you can see behind her ultra-all-business exterior, there actually is an engaging 3D character who loves to act passive until the second you can’t take it anymore and then she’s concocting potions to use on bullies. Her interplay with Adrian was great as well. Somehow she managed to fire back at him as much as Rose ever did, but maintain a completely different vibe with him then Rose. It was quite well done and very enjoyable to read. Now, enough about the characters… The book on a whole was very enjoyable and an easy read that flowed together. Like I said, the beginning was slow, but once Mead actually got to the meat of the story it only went up from there. Several of the key plot points were easy to figure out, but I did NOT expect the end, ESPECIALLY the cliff hanger she leaves it on. I don’t want to spoil it, but VA fans will want to shriek with happiness, and I myself need The Golden Lily in my hands RIGHT NOW because stuff is about to go DOWN. 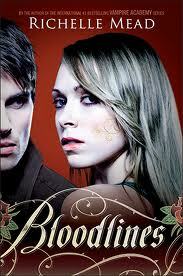 All and all, Bloodlines was a different tone from the VA series, but in a good way. It was a good set up for the rest of the series, and I know it’s only going to go up from here.